Common Name: Poria, Indian bread, Hoelen Tuckahoe. Dried sclerotium of the fungus. Sichuan. The herb is collected from July to September, cleaned, spread, and air-dried. This operation is repeated several times until wrinkles appear and the inside water is evaporated. The herb is then sliced and used unprepared. Meridians: Heart, spleen and kidney. Functions: 1. To transform dampness and strengthen spleen; 2. To calm the mind. 1. Dysuria and edema. 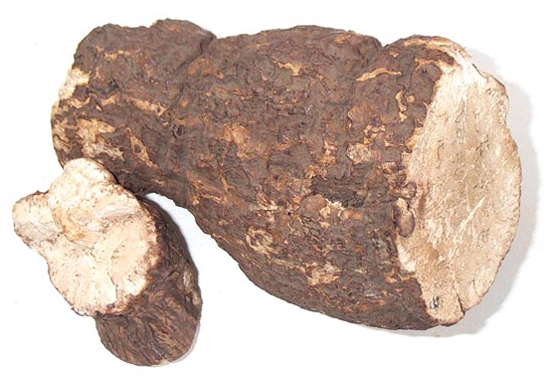 Poria (Fuling) is used with Umbellate porefungus (Zhuling), Alismatis rhizome (Zexie) and White atractylodes (Baizhu) in the formula Wuling San. 2. Retention of phlegm and fluids manifested as dizziness, palpitations and cough. Poria (Fuling) is used with White atractylodes (Baizhu) and Cinnamon twigs (Guizhi) in the formula Ling Gui Zhu Gan Tang. 3. Excessive dampness and deficiency of the spleen manifested as poor appetite, diarrhea and lassitude. Poria (Fuling) is used with Pilose asiabell root (Dangshen) and White atractylodes (Baizhu) in the formula Sijunzi Tang. 4. Palpitations and insomnia. Poria (Fuling) is used with Wild jujube seed (Suanzaoren) and Polygala root (Yuanzhi). 5. For lassitude, anorexia, and loose stools due to Spleen Deficiency, it is used with Radix Codonopsis (Dang Shen), Rhizoma Atractylodis Macrocephalae (Bai Zhu), and Radix Glycyrrhizae in “The Four Gentlemen Decoction” (Si Jun Zi Tang).